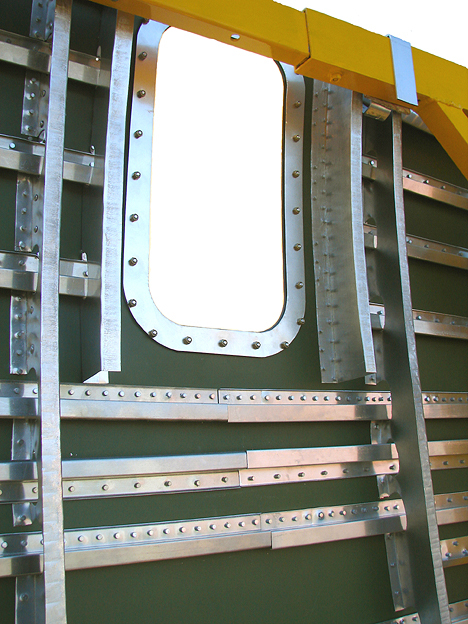 Our Flagship "Masterpiece" has been painstakingly researched and re-engineered to produce the finest reproduction aircraft panel sculpture in the world. Ideal for Aviation Museum Exhibits, Hangars, Corporate Showcase Sculptures for Logos and private sales. 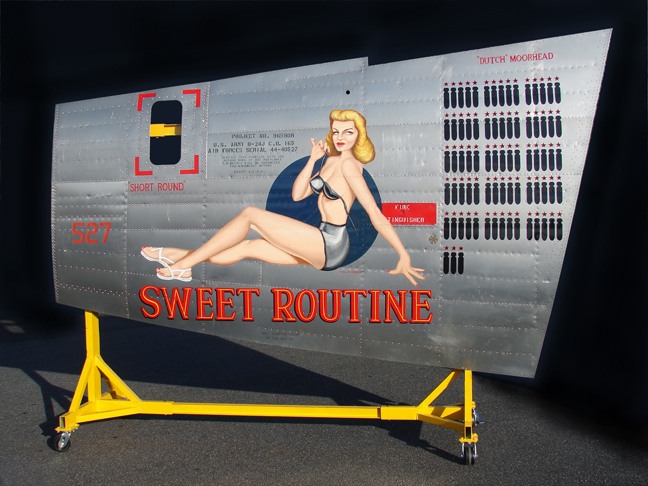 Historical Nose art markings for all theaters in WWII is available and pricing is based on the amount of work needed. A view of the back illustrates the complex framework structure. The panel size is 11.5" feet in length and 7.6" tall. 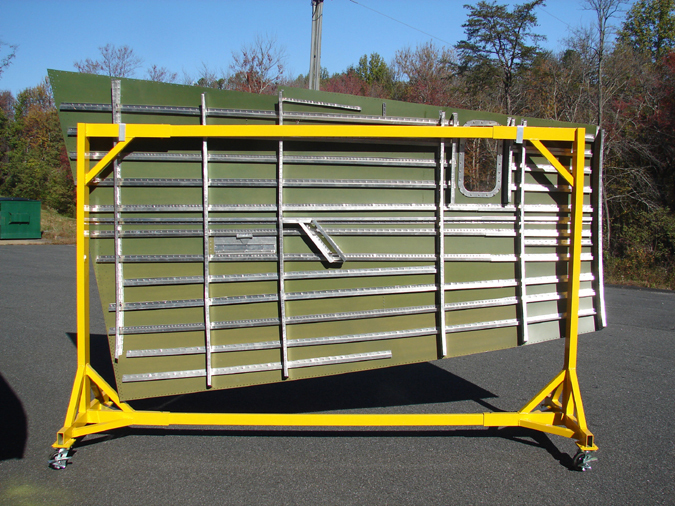 The optional self supporting display stand is of aluminium welded tubing and finished in a chromate yellow powdercoating for durability. A closeup reveals the level of detail in the formers and Acrylic plexi window. The panel has a slight compound curvature and is exemplified towards the top and bottom ends of the formers. A coat of Green Zinc Primer is applied to the back side of the skin but the formers and stringers are left "Mil Spec" finish, as it was produced in WWII. 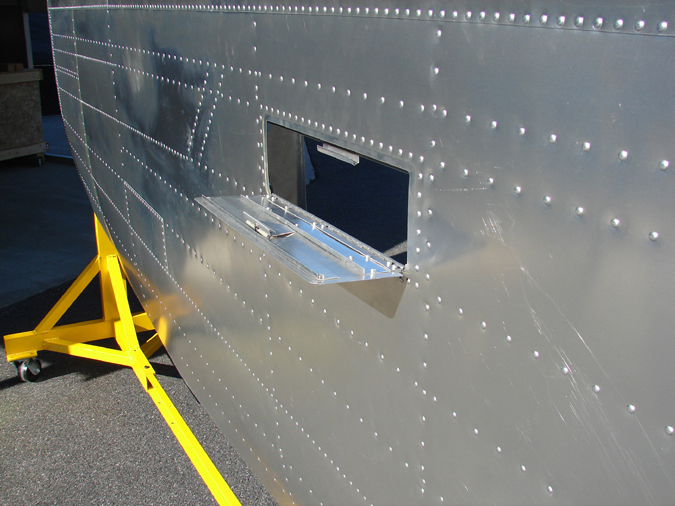 Subsequent panels in the near future will be modified for the various B-24 models. 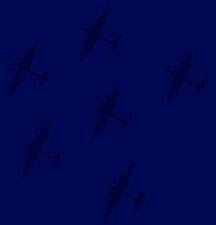 This means that we will be able to change the window configuration to represent the different models to a D/H/L /M and F-7 Photo version. 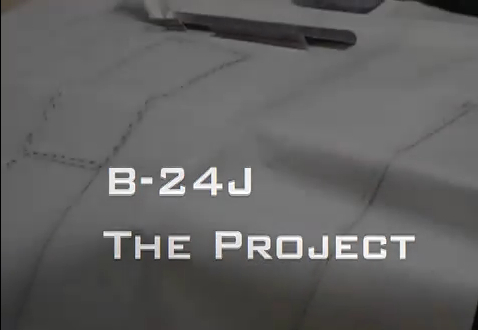 Ultimately we will also produce a PB4Y-2 Privateer version extending the nose section per the original. The Fire Extinguisher access door is also faithfully reproduced exactly right down to the spring mechanism. Missing is the actual Fire Extinguisher and hardware to contain it. We did not see the need to add this feature...but anything is possible. Call for complete package options. Crating and shipping to destination varies.